Unfortunately, the ceremony is now running considerably behind schedule, as the regal tortoise who’s been carrying brides to the altar at royal weddings for the past 400 years is taking, like, half an hour to get Meghan Markle down the aisle. 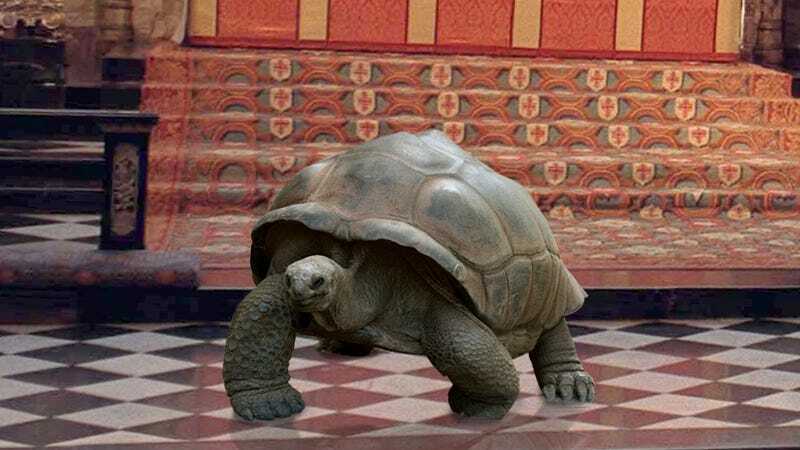 Despite having entered with the bride through the church’s narthex over 28 minutes ago, the flower-adorned tortoise, named The Magnificent Geoffrey, has only made about 15 feet of progress down the roughly hundred-foot aisle, and he is breathing very heavily. It is clear that The Magnificent Geoffrey no longer possesses the same vigor as he did when he carried Charles I’s bride down the aisle at his first royal wedding back in 1625, as he is basically now dragging his hind legs on the ground behind him, pulling himself forward inch by excruciating inch while Lady Markle stands patiently atop his scab-covered carapace, smiling and waving at guests. In an effort to hasten the proceedings, young Prince George is currently attempting to lure the ancient fellow forward with a trail of pepperonis, but with eyes rendered all but useless by thick yellowy cataracts, the pitiful beast has not yet detected the treats and is continuing forth at his own glacial pace. Making matters worse, the venerable reptile has voided his bowels at numerous junctures during the procession, sullying the train of Lady Markle’s white gown and clouding the great chapel with a nauseating odor. At his current clip, the tortoise will not reach the altar until after sundown.